approaches and performance over the course of the year. It reflects the importance that Sustainability plays in our operations. 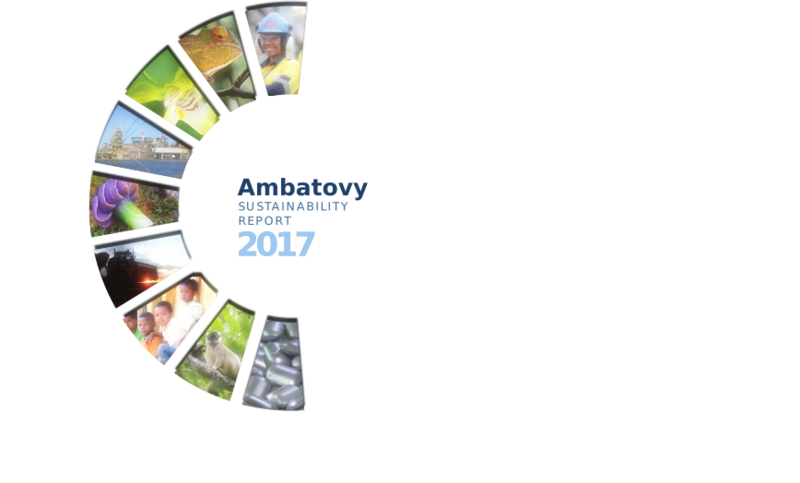 I am very pleased to share with you Ambatovy’s eighth annual Sustainability Report covering our objectives, approaches and performance over the course of the year. It reflects the importance that Sustainability plays in our operations. For our operations to be conducted in a responsible manner and in order to have an enduring, positive legacy for Madagascar, we must continue to put Sustainability at the core of our planning and decision-making. 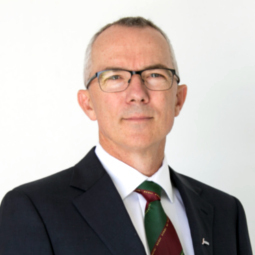 This principle guides our work and is embedded in our approaches to stakeholder engagement, social and economic investments, governance, the workplace, the environment, and safety and security. 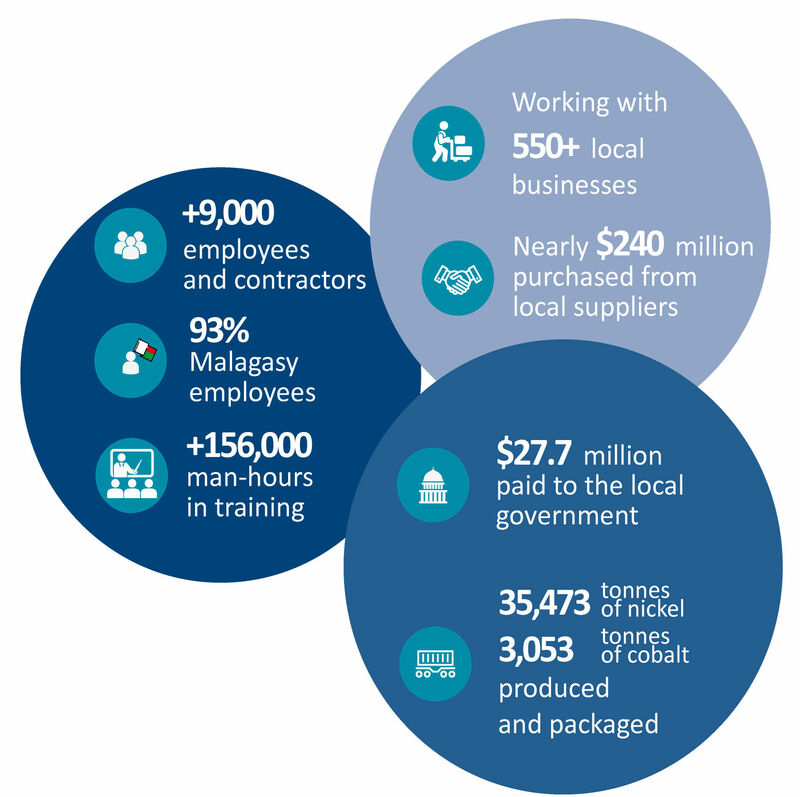 In 2017, Ambatovy made great strides in working towards our goal of becoming a low-cost nickel producer that creates lasting prosperity for all stakeholders and that contributes significantly to sustainable development in Madagascar. 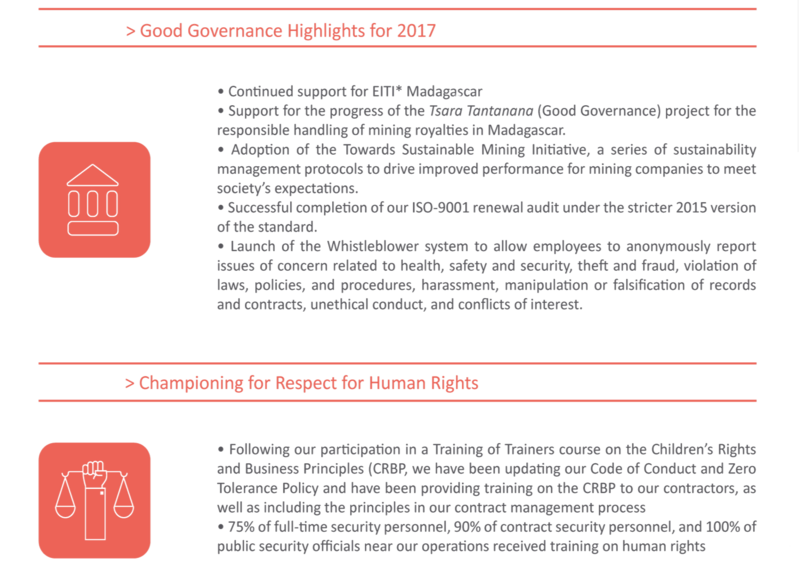 Ambatovy’s operational priorities in 2017 were focused on zero harm and a transition to a steady state of operations. Despite the constraints imposed by a volatile global commodities market, Ambatovy continued to push towards our full production capacity while continuously improving our safety culture. We are pleased that during the year, we experienced no work-related or community fatalities and achieved the lowest All Injury Frequency Rate (AIFR) in our history. For our operations to be conducted in a responsible manner and in order to have an enduring, positive legacy for Madagascar, we must continue to put Sustainability at the core of our planning and decision making. We have a responsibility to conduct our operations in a way that does not create undue environmental, social and economic harm in the zones where we operate. We expect this of ourselves, but our internal and external stakeholders expect such performance as well. 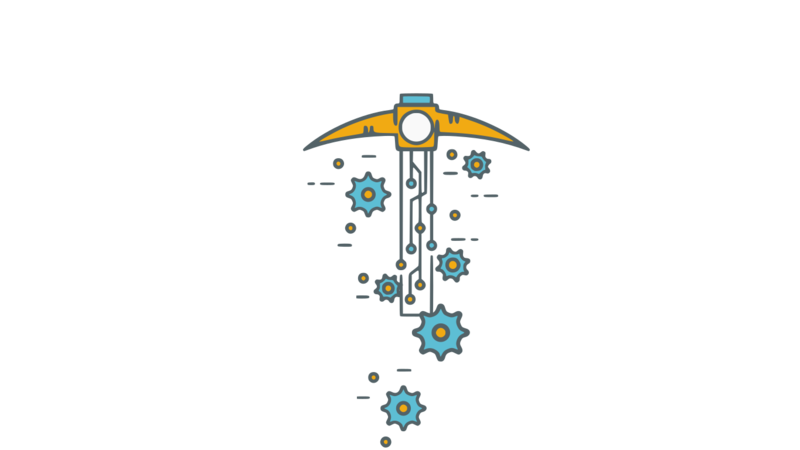 To help us in that regard, Ambatovy will be adopting the principles of the Towards Sustainable Mining (TSM) program that our operator, Sherritt, has committed to implementing as a new member of the Mining Association of Canada (MAC). The adoption of TSM represents another step in holding ourselves accountable to a level of performance in sustainability that is increasingly becoming the expectation of our stakeholders, including the Malagasy government, local communities, customers, our shareholders and lending institutions. During the year, Ambatovy's operations were subject to two emergency events: Cyclone Enawo and the plague epidemic. While we cannot control these occurrences, we can control how we prepare and respond to them. Cyclone Enawo resulted in serious damages and loss in Madagascar but fortunately, there were limited impacts on our operations and we were able to contribute to local disaster relief in the days and weeks that followed the storm. During the plague epidemic, serious health and safety concerns were raised for our employees, contractors and neighboring communities. Ambatovy’s prevention measures helped us to safeguard the health of employees at our sites and, through strong and effective collaboration with local authorities, local organizations and UN agencies, we were able to support treatment centers caring for plague victims. The Scientific Consultative Committee (SCC), comprised of independent experts who provide advice on our environment and social programs, held their biennial meeting with Ambatovy’s Sustainability team and presented a series of strategic recommendations for our review. To improve air quality management, Ambatovy implemented a program of isokinetic stack sampling, designed to measure air emissions directly over the stacks. Significant progress was made on projects supported through the Social Investment Fund (SIF), including the completion of the Moramanga and Brickaville markets and the rehabilitation of some roads in the regions where we work. In early 2017, we successfully underwent an audit to renew our ISO 9001 certification, this time under the new and more stringent 2015 version of the ISO 9001 standard. Manganese concentrations in water near the Tailings Management Facility (TMF) continued, at times, to exceed compliance criteria during the year; however, there are a number of initiatives underway to improve controls, to mitigate impacts, to provide a better understanding of the root causes of the problem, and to design precise and effective corrective measures. The first inter-ministerial order determining the terms of royalties management and their distribution to decentralized territorial collectivities was formally signed in 2017, marking an important milestone in the good governance of mining royalties. Supporting the Government's efforts to control and eradicate the Asian Toad population. These achievements could not have been possible without the commitment and dedication of all our stakeholders, especially our employees and partners. I am confident that with the gains and progress made in 2017, Ambatovy is well on our way to achieving our vision of being recognized as the world’s most successful nickel laterite operation. Thank you for your interest in Ambatovy. We hope that you enjoy the report. Ambatovy is committed to working with integrity, respect, and the highest ethical standards to endure that we are an organization that respects our communities, our partners, and our employees. In the line with this commitment Ambatovy takes human rights very seriously and we have gone to great lengths to integrate respect for human rights in our operation and sustainability strategies. Our standards for behaviour are enforced across our organization, including with our suppliers, employees, and contractors. Ambatovy is aware that our presence in Madagascar can have considerable economic impacts at the national, regional and local levels. Our vision is to significantly contribute to Madagascar’s development and to maximize the economic returns of our operations to our local communities. Between Ambatovy's two operating facilities (Mine and Plant), a 220 km pipeline, and nearly 14,000 ha of environmental conservation areas, there are numerous possible impacts to be felt by the local population. With an emphasis on health, livelihoods, and education, our Communities and Social Relations program ensures that we do our part for sustainable development and uphold our commitments to the communities neighboring our operations. 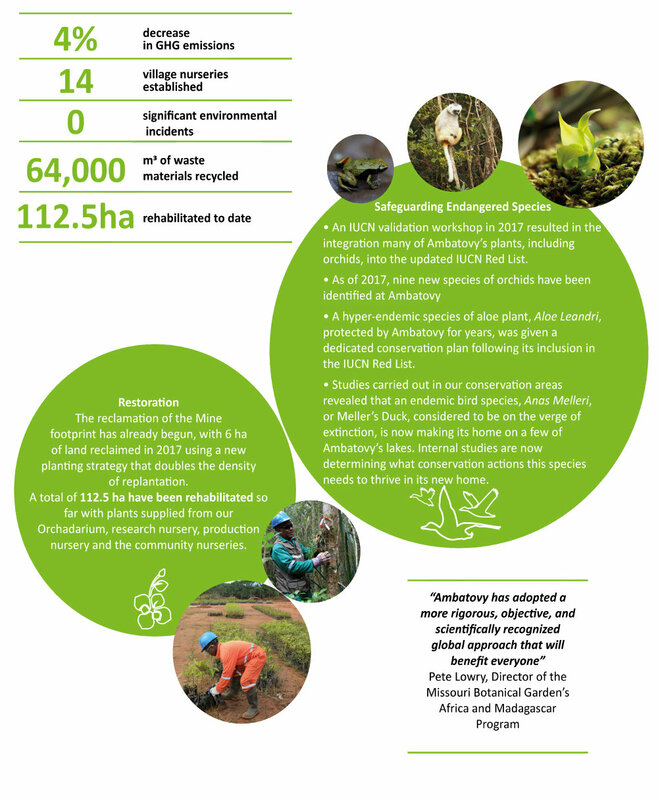 One of Ambatovy’s key goals is to minimize the impact of our operations on Madagascar’s environment. With regards to biodiversity, the aim is to achieve no net loss, and, preferably, a net gain. We plan to accomplish these goals with rigorous mitigation techniques such as avoidance, minimization of risks, timely restoration of a sustainable landscape, and the offsetting of residual impacts. At Ambatovy, we recognize our workforce as one of our most important assets. We have two employment commitments: to optimize national employment and to develop a highly-skilled workforce in Madagascar. A number of policies and strategies are in place to ensure that Ambatovy is an employer of choice in Madagascar, including focusing on capacity-building, emphasizing internal communications, instilling a safety culture, and promoting fairness, equity and diversity in the workplace. We believe our success will depend on recruiting and retaining a cohort of employees that are committed to our vision, values, and long-term operation. The United Nations' Sustainable Development Goals (SDGs), a follow up to the Millennium Development Goals, consist of 17 ambitious targets to address global issues and to ensure a sustainable and resilient future for the world by 2030. 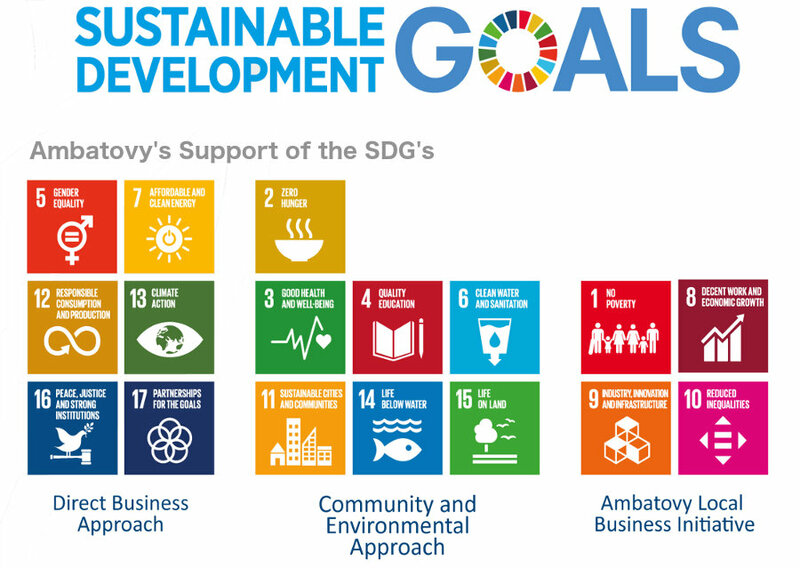 There are several ways that Ambatovy supports and contributes to Madagascar's achievement of the SDG's, particularly throughout our overall business approach, our extensive investments in social and environmental activities, and through our commitment to supporting the growth of the Malagasy industry and small business through the Ambatovy Local Business Initiative. Ambatovy © 2018. All Rights Reserved.